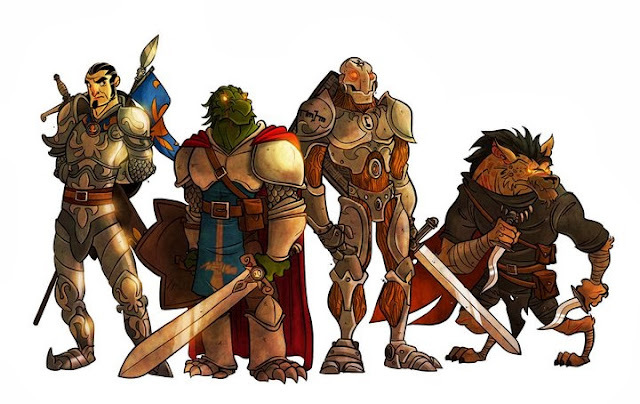 In the past months, several good people and one person whom I don’t know, but who conceivably also be a good person, asked to see the original D&D kids that were posted on the Wizards website during the Jurassic era. I could simply re-post these articles, but I decided to do more: I will update them. It’s been some years since I wrote my first article on the subject. In retrospect, some of the advice there was less than perfect. In Geekspiel, I have gained a level in life, so there’s no reason for the articles not to advance as well. Hello boys and girls (not to mention parents, teachers, and librarians)! D&D is a great activity for kids. It encourages creativity and teamwork, develops the imagination, and encourages self-expression. It can be used to teach history, folklore, mythology, and even religion. You can examine moral and ethical dilemmas through D&D. Ordinarily tedious subjects become much more exciting when "experienced" via roleplaying since the students become involved on a much more personal level. Hell, D&D even helps with math (quick, what’s your attack bonus with this power?). But most important of all… D&D is fun! What’s not so fun, at least for inexperienced Dungeon Masters, is the transition from playing with your adult friends to playing with kids. On top of the usual challenges that arise from working with kids—challenges that any schoolteacher would love to tell you about at incredible length—one also constantly gets burned by bumping into rules and concepts that can be too complex or boring for young children. And oh boy, did I get burned in my first year! But as Nietzsche said, “That which does not kill us makes us stronger.” I’ve learned from my mistakes and developed techniques to make the transition from playing with bearded dudes to mischievous students as smooth as possible. And I’m here to share these techniques with you—along with actual anecdotes and drawings from some of the kids I’ve taught. One of the least fun aspects of playing with kids is character creation, or, to be more precise, character comprehension. I've yet to see a beginner group which understood how defenses are calculated and used in a reasonable amount of time. Same goes for ability scores vs. modifiers, skill mechanics and so forth. It’s not that kids can’t comprehend those rules. It’s just that they’re far too eager to start killing monsters and gaining superpowers to concentrate on dry mechanics. Race and class is the first, and most important, choice a new player has to make. I suggest to write down all classes and races on a whiteboard before the game starts and then briefly go over each race and class. Once each kid chose his race/class combination, explain their character traits in the shortest and clearest terms while avoiding technicalities as much as possible. For example, “Eladrin are fairies who look like elves and can teleport once per encounter” is a sufficient description. Longer descriptions means chatter in the ranks, which in turn means time wasted on discipline and bored or angry kids. Distribute ability scores using set numbers. I usually use the rather high set of 16/14/13/12/11/10 for increased character survivability. Heavens forbid you should use random dice rolls (unless you like the sound of crying children) or point allocation (unless you wants to create ten characters all by yourself). Make sure you state what abilities are important to what classes are you might end up with kids playing very intelligent fighters with asthma, or wizards who only got into the academy because they were good at football. Be prepared for the fact that some kids won’t want to be like “everyone else” and will ask to play non-standard races and classes. Kids with access to the Monster Manual will always ask to play Orcus. Kids without the Monster Manual will often invent absurdly overpowered god-like races and ask to play them. 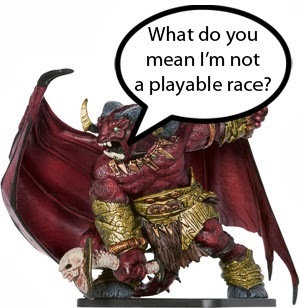 To deal with this problem, I recommend arguing with the kids for a while and then “surrendering” and allowing them to play some “special” races such as shadar-kai or minotaurs (as per the Racial Traits appendix in the back of the Monster Manual). Another approach, one that entails much more work on the part of the DM, is asking kids to draw and describe the character they want to play and then to design—with or without them—appropriate statistics for their creations. You’ll be surprised at just how creative and original (and occasionally random) kids will be! In any case, start playing as soon as possible and start with a bang! Kids get bored very quickly and once you’ve lost them, it’s very difficult to get them back on track. Long and flowery descriptions will be interrupted within seconds... but more on this later. For now, let’s proceed to character features. Write down or dictate racial and class traits and then briefly explain what each trait does. There aren’t many traits, so this shouldn’t take too much time. When decisions are called for, advise or at least clearly state the advantages of each option—don’t just throw a bunch of unfamiliar terms at the kids, because they’ll go into one ear and right out of the other. Warlock’s Curse: Explain this power first because it’s both the most important of the Warlock’s powers and because it’s necessary to understand it for the boons granted by the Eldritch Pact. At the beginning of your turn you can curse an enemy. Cursed enemies take more damage from your attacks. Also, you gain different rewards for defeating them, depending on your pact. Eldritch Pact: You choose where you are getting your powers from. Fey Pact: Your powers come from nature. Fey creatures transport you a short distance every time you kill an enemy you’ve cursed. Infernal Pact: Your powers come from the underworld (you might explicitly state from Hades, Valhalla or even Hell depending on the player’s age and circumstances—you obviously wouldn’t want their parents uncomfortable with the game or any of its concepts, after all). You receive a small amount of hit points every time you kill an enemy you’ve cursed. Star Pact: Your powers come from space aliens (it’s a deviation from the Player’s Handbook, but kids get excited about this...). Every time you kill an enemy you’ve cursed, the aliens reveal to you a bit of the future, giving you a small bonus to your next roll.Prime Shot: You may skip this one as kids are unlikely to use it. If you do use it, just read it from the book as is, because its description is already short and simple enough. Shadow Walk: Only one in ten kids will use this feature during the game. So it might be more trouble than it’s worth. That said: "If you move three or more squares, you’ll be concealed in the shadows until your next turn. But remember—being concealed means you’re harder to see and attack, not invisible!" Arcana: Knowledge of magic and magical beings. It does not confer any magical powers. Dungeoneering: Survival and navigation in underground environment. It does not confer any architectural, digging, or trap-making or detecting powers. Heal: Treating sickness and stopping deadly bleeding. It does not confer the ability to return lost hit points to characters. I recommend that you start using skills as soon as possible for one simple reason: kids love to roll dice. Often they’ll roll as soon as their turn is announced without even bothering to tell you what they're doing. Heck, even when it’s not their turn they’ll still constantly roll dice, joyfully announcing each time they get a 20 while ruefully lamenting their 1’s. Make sure to use as many skill checks as possible to satisfy their roll-lust. When using skill challenges, don’t just state how many successes must be achieved in each skill. Instead, start a class debate and give each kid a chance to convince you how a particular skill can help. Skill challenges should give everyone a chance to shine. Encourage creativity, but don’t automatically go with any mad scheme that lets a character use an unrelated skill he happens to have a high bonus in. I found the best way to deal with powers is to wait until the kids start a combat encounter before introducing attack powers. Suddenly, choosing powers is no longer about going over tedious lists and listening to boring information they only partially understand. It’s a matter of life and death! At the beginning of each kid’s turn, open the book to the appropriate page, very briefly explain the advantages and disadvantages of each at-will power and then let the player choose the one he would like to use right now. As the going gets tougher, the same should be done with encounter powers and daily powers. For example, when a kid playing a fighter is choosing his first daily power, ask him whether he would rather cause triple damage with one blow (brute strike), double damage and heal himself (comeback strike) or double damage now and a little more with all subsequent attacks (villain’s menace). When he chooses his power, describe it as a sudden explosion of wrath and desperate heroism in the face of overwhelming odds, something which marks his transformation from a mere soldier to a hero destined for greater things. This is not just another attack roll. This is a dramatic, life-altering moment! And while we’re talking about combat, make sure to explain to kids that adventuring is a very dangerous career and some characters will die in the course of their campaign. Not necessarily because they did something wrong, but because they were in the wrong place in the wrong time. C'est la vie. When a character does get killed, present it as an exciting opportunity to experience new classes and races, not as a failure. I also like to reward players whose characters nobly sacrificed themselves for the common good or had their character die in a dramatic and impressive way. While often contributing to cinematic and memorable combat encounters, this system should be used with discretion as it tends to encourage bleak fatalism which is not appropriate to some groups. Particularly young children (7-8) are likely to become quite sad or mad by casual character death. It’s best to have their characters simply faint... but more on that next week. My advice is: don’t. The amount of time it takes kids to go over the feat list and the amount of questions that will be asked makes the whole process more headache than it’s worth. One can go perfectly well through 1st level without a feat, while skills and powers offer enough options for customization to make each character unique. If you must use feats, it's best you hand out two feats upon reaching 2nd level. To speed and simplify the feat-choosing process, I recommend preparing abridged lists suited for each child’s character class, race, abilities, and style of play. This way you will downsize the choice from more than eighty feats to less than twenty feats. It’s also possible to hand out feats according to personal achievements and style of play (think of the old show Visionaries: Knights of the Magical Light). Older kids (9+) might resent this loss of freedom of choice, however, and should be given in the very least 2-3 options. First, while this might seem obvious to you, nevertheless make sure to explain to kids that the game takes place in a medieval (though magical) setting and that the items they carry should fit the technological level of the period. If you don’t, half the kids will start the game with M-16’s while the other half will have Generation Seven mobile phones. There are two basic strategies to equipment selection which I found to be the most fun and efficient. 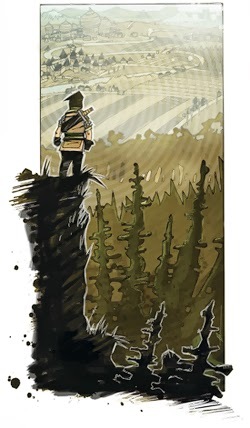 Rags to Riches: Have the group start playing equipped with nothing but knives and clubs, but be generous with treasure in the first few encounters. While the players won’t get their dream-choice of equipment, every piece will feel special because it will be associated with victory and hard-work. A) The characters are prisoners who have to escape a strange prison with nothing but the clothes on their backs and no memory of how they got there. B) The characters start play as destitute poor, given a shot at greatness by a kindly patron, a damsel in distress, or a chance to overthrow some conspiracy against the city that only they are aware of. What do you prefer: a one-handed weapon which leaves a free hand to carry a shield, or a two-handed weapon which deals more damage but leaves you vulnerable to attacks? Cool. What do you care about more: precision or damage? Is damage the most important thing for you, or do you also want to reach further enemies with your weapon? Damage! I want to smash enemies into little pieces! Alright... then you should take a greataxe. That is the perfect weapon for a savage like you! The same can be applied to armor (“speed or safety?”). Adventuring gear and other basic equipment, such as spellbooks for wizards or thieves’ tools for rogues should simply be dictated to the players without too much discussion; no one ever says no to free stuff. Note that given free reign, some kids will fill the inventory, write over the edges of the page, and then turn it over and write on the back of the page as well. Limit "free items" to a handful and go over the list carefully, or else you might be surprised to discover one kid has a lightsaber while another has a five-mile-high ladder. Lastly, while not equipment in the strictest sense of the word, I recommend using this stage to give each player’s character a pet. Kids love pets. You should love them too because they create more opportunities for roleplaying, can save the group when the situation seems desperate, and add flavor and a chance for some goofy jokes to your game (passive-aggressive cat anyone?). Dungeons & Dragons is a roleplaying game. Storytelling and moral choices have equal, if not greater, importance to killing monsters and gaining levels. To help the kids start on the right trek, I like to conclude character creation with a process I call “prologue” (or “intro” for the video game generation). Explain that class is not really a job or a personality, but rather a set of game abilities. For example, a fighter is simply someone who knows how to use weapons and armor and to roll with the blows. Some fighters are righteous champions in the service of a king, while others are heartless killers who live in the wilderness and prey on the weak. Still others are soldiers, mercenaries, fencing instructors, or even gardeners who were forced to learn how to fight by the circumstances of their lives. And the same could be said about warlocks or any other class in the Player’s Handbook. After everyone has chosen their concept, write them all on the board and proceed to the next stage: party concept. Ask the group to make suggestions as to why they are together (a rebel cell fighting against a tyrant, an elite military unit, citizens concerned about the ecology, etc...) after collecting five or six ideas, write them on the board and have the group vote on their favorite concept. This serves two purposes; first, it gives kids a sense of purpose, and helps them make sensible decisions during their adventuring career with the concept as their moral compass and modus operandi. Second, it helps you choose a setting and a gaming style more suited for the group's particular interests and needs. For example, one group decided that they were spirits returned from the afterlife to take horrible vengeance on the aristocrats who used and then murdered them most foully. Obviously they were looking for dark and violent adventures. The extensive hit lists I was handed next session reaffirmed this belief and helped me design appropriate encounters for them. A dry-erase board. This schoolroom cliché is so incredibly helpful in DMing for children that it can almost be considered a necessity. Unless you’re running an atmospheric game beside a bonfire or something of that sort, make sure to have a whiteboard and markers in different colors handy. It will make explaining everything much easier, combat sequences much more orderly then with miniatures (they’re just too tempting to leave alone) and instills a more serious and school-like atmosphere among the kids.